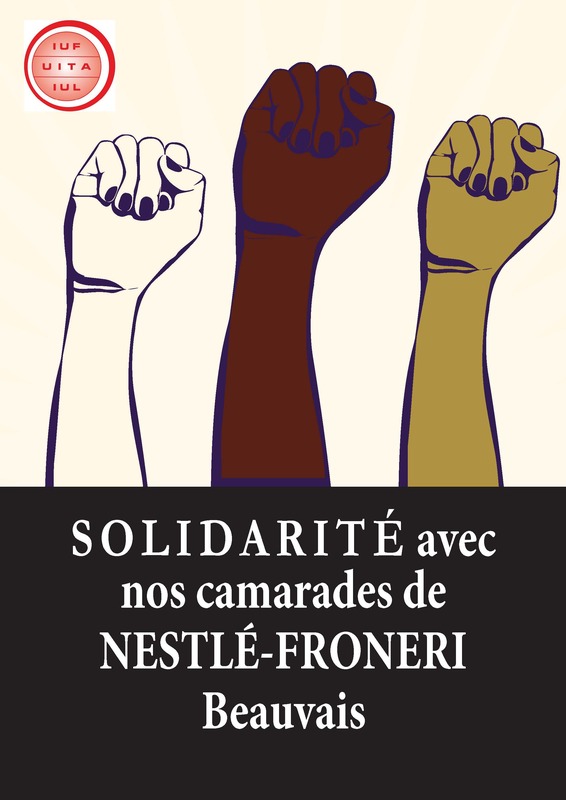 Nestlé announced in January its intention to close its Timisoara coffee and confectionery factory in western Romania, which currently employs some 388 workers, by the end of May. 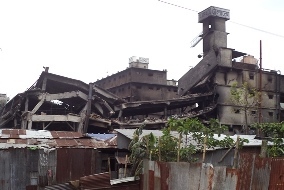 Commitment and solidarity have resulted in a comprehensive agreement covering workers affected by restructuring. Froneri, Nestlé's ice cream joint venture, announced in October its intention to close yet another former Nestlé site, the factory and research centre in Beauvais, France. The unions represented at the factory have reached a settlement for the 317 workers which will provide a decent foundation for their future. 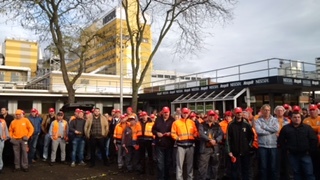 Nestlé workers from across Europe attending the Nestlé European Works Council on 27 November 2018 expressed solidarity with workers in France where Nestlé plans to close Purina and Froneri sites. 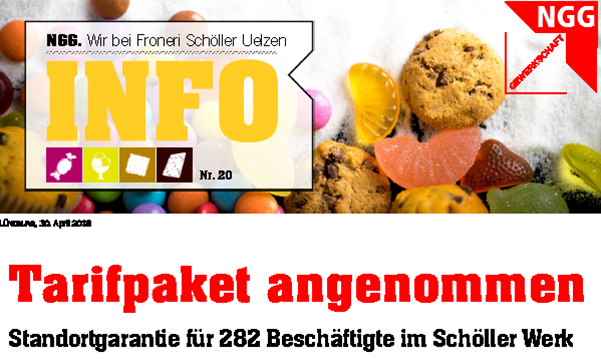 Nestlé intends to close the quality assurance laboratory in Germany - the NGG and its members at Nestlé have committed to fight! 400 Nestlé workers from across Germany travelled to Vevey, Switzerland, for a mass protest at Nestlé headquarters on October 2 against measures threatening the employment of some 600 workers in Germany. 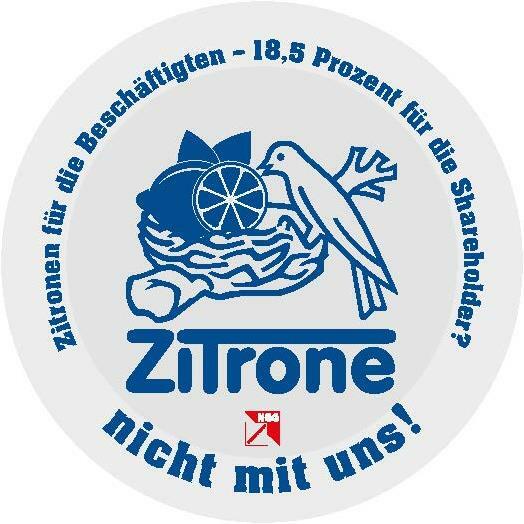 At the meeting on 25 June, delegates presented Nestlé European management with a "nest" full of lemons in solidarity with workers who are being squeezed for juicier profits. 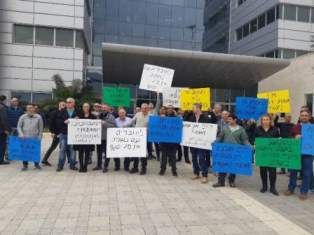 At the end of April Nespresso announced the introduction of new shift patterns which will significantly worsen working conditions at the 3 factories in Switzerland. 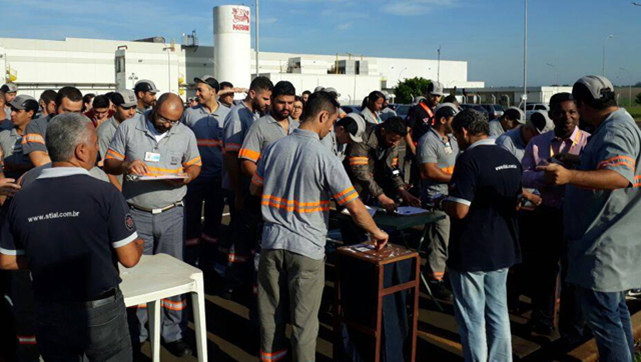 Following changes to the labour code in Brazil in 2017 which removed the mandatory deduction of union dues, workers at the Nestlé factory in Cordeirópolis met in general assembly and voted overwhelmingly to have their union dues deducted at source and transferred to their union, STIAL. After 8 months of negotiations - punctuated by strikes and demonstrations - a settlement was reached and ratified by a majority of the NGG membership in late April. 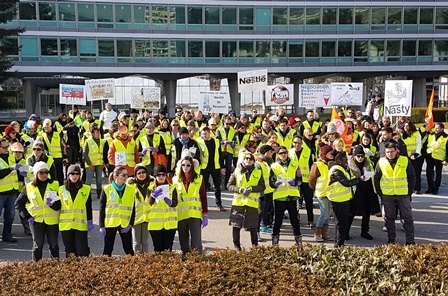 Nearly 200 workers from the Nestlé-Galderma research centre near Nice in the south of France travelled overnight by bus to demonstrate in front of Nestlé headquarters in Vevey. 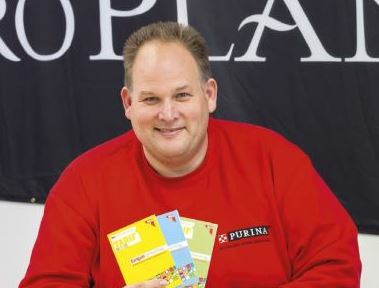 An article in the NGG magazine "Einigkeit" featuring Michael Königsfeld, chairperson of the works council at Purina in Euskirchen. 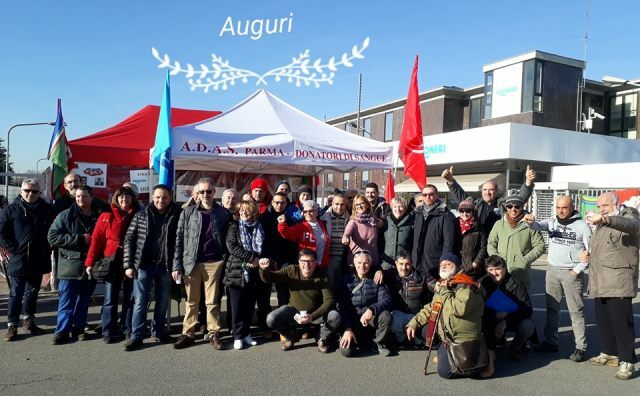 On 11 December, the German Foodworkers Union, NGG, visited the "red tent", the site of the workers' permanent protest in front of the factory gate in Parma. 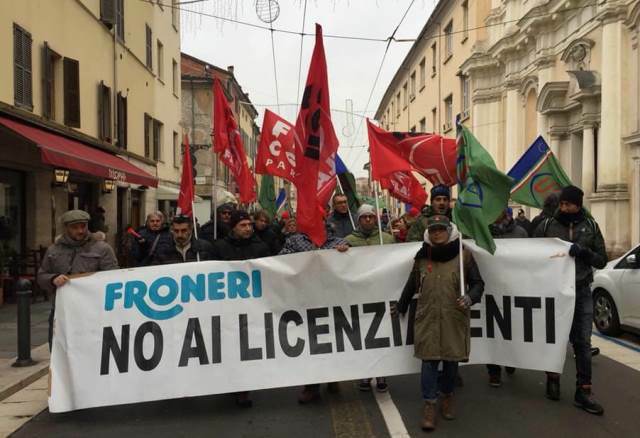 A delegation of 50 Froneri workers and their trade union representatives from FLAI-CGIL and UILA-UIL travelled on 29 November from Parma in Italy to Switzerland to carry their fight against the closure of their ice cream factory to Nestlé's doorstep. 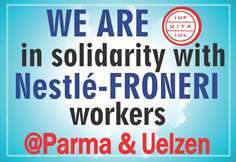 A large delegation of workers and their trade union representatives from Nestlé's joint-venture Froneri ice-cream factory in Parma, Italy will be travelling to Vevey and demonstrating at the Nestlé headquarters on Wednesday, 29 November. The IUF is calling on affiliates to show support! The IUF is calling on affiliates to show their support! 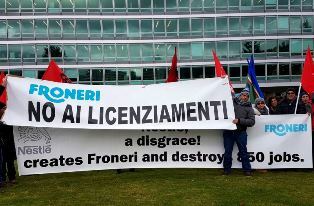 One year after the creation of the FRONERI ice cream joint venture by Nestlé, the company has launched a full-blown attack on workers throughout Europe. Workers at the former Nestlé factory in Parma have been informed that the company intends to close the factory and dismiss 180 workers. Workers and their union representatives learned on 25 April of Nestlé's proposal to change terms and conditions and cut jobs at four factories producing chocolate and confectionery in the UK. More than 360 workers set up picket lines at a Nestlé Canada manufacturing plant in Toronto on May Day after contract negotiations between Unifor Local 252 and the food processing giant broke down as the IUF affiliate demanded an end to temporary workers being employed in permanent jobs. 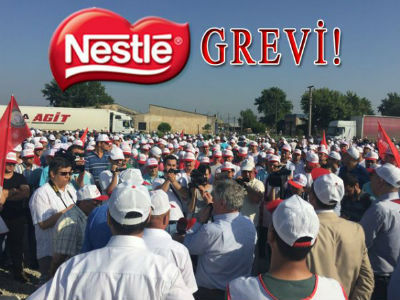 Following an 11 day strike, IUF affiliate Tekgida-Is signed a collective bargaining agreement with Nestlé to apply at its multi-product site at Karacabey in the province of Bursa, Turkey. The statement underlines the values of unity and solidarity which underpin the trade union movement and the central role of trade unions in promoting equity, fairness and inclusiveness. Members of the Nestlé Moscow Medical Representatives' Union organised a leafletting action on October 12 to inform their co-workers about workplace issues and union activities and the benefits of joining the union. 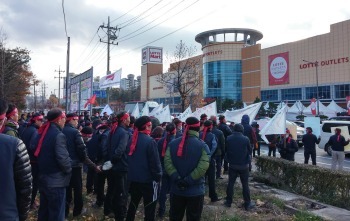 The first-ever collective bargaining negotiations at pizza manufacturer Nestlé Wagner - begun in September 2014 - were successfully concluded on 20 May 2015. The German food workers union, NGG, has negotiated a collective agreement for the approximately 1,700 employees, which comes into force on 1 September.